If you want to keep your 305 or 350 but have a more modern 4l60e/65e/70e that was behind a 4.8,5.3,6.0 or 6.2L engine then you need this kit. I find this interesting, because now I can install a 4l65e from a 2006 2wd SS Silverado into my 1997 2wd rcsb. The electronics are the same in all the 4l60e transmissions. The 4l70e has the TCM inside its case. GM metric flexplate bolts (6) 12553332 Scoggin-Dickey 2.52 ea. GM metric pressure plate bolts (6) 12561465 Scoggin-Dickey $0.56 ea. Edit April 2013: I added this pic as it shows the differnce in dimensions in the distance between the trans mount face and the very end of the crankshaft. The GEN 3 crank extends towards the trans furthur than a GEN 3 engine, so if you want a GEN 3/4 trans behind a GEN 1 engine, you need to space the trans back slightly with the GM kit 19154766. If you have a GEN 3 engine and want to use a trans that was from a GEN 1 vehicle, you will need the crank spacer 12563532, 6 longer bolts 19257940 and flexplate 19260102 . I though some of you might find this interesting. Good info... thanks for posting that. I find this interesting, because now I can install a 4l65e from a 2006 2wd SS Silverado into my 1997 2wd rcsb. The electronics are the same in all teh 4l60e transmissions. The 4l70e has teh TCM inside its case. the spacer and bolts are all GM parts, you would also need the flexplate from a gen3 engine that had a 4L80E. the 4L80E didnt change input shaft length when they went to gen3. I had an extra spacer, flexplate and bolts that my friend used to install a 5.3 in to a 95 burb that he used the stock 95 4L60E and the 2002 411 runs everything just fine. The 4L60E is still holding up to my amazement since it was behind the stout TBI™ before and has 170K on it. That's some really good info. Bump as I added the info for the Hughes Flexplate Adapter that allows an older 4l60e designed for GEN 1 and GEn 2 apps to work behind a GEn 3 or 4 engine. The GM parts you listed first work for the Gen 3/4L60E combo, thats what I have intalled on my '03 6.0/'96 4L60E combo. The GM parts you listed first work for the Gen 3/4L60E combo, thats what I have intalled on my>>>>>>>>>> '03 6.0/'96 4L60E combo<<<<<<<. More info here, this is a list that shows the differences in flywheel flange thicknessess. The AERA Technical Committee offers the following information on crankshaft replacement caution for 1998-2003 GM 4.3, 4.8, 5.3, 5.7 and 6.0L engines. Design changes in the flywheel flange thickness have been made to some crankshafts used in the above-mentioned engines. This bulletin is being re-published with additional information. The later crankshafts are shorter on the flywheel flange as seen in the listing below. These changes are due to the many different vehicle / transmission combinations being built by GM. A flywheel spacer ring GM Part #12563532 and a longer bolt set GM Part #12563533 is required when using a thin flange crankshaft to replace a thick flange crankshaft. Also, if the crankshaft is being used in a vehicle, which is a standard shift application, you also need pilot bushing GM Part #12557583 or 12479894. Note: GM part numbers correct as of 12-18-04. All GEN III crankshafts used in Camaro, Corvette and Firebird have a .857 thick flange and also have a freeze plug installed at the bottom of the pilot shaft hole. The 4.8, 5.3 + 6.0L don?t have the freeze plug. The drilled hole thru the centerline of the 5.7L LS1 & LS6 crankshafts allows a path to balance crankcase pressure within the lower crankcase. Doing so has eliminated possible oil consumption when the engine is operated over 4800 RPM. Caution: Early crankshafts use a flat reluctor wheel and late have a recess. Recess will work on all years. Do not use a flat reluctor on late applications as it will cause an engine misfire. Bump for new kit part numbers and prices. I thought you would need a 411 computer to run the 4l65e in gmt400? No sir, you can run the 65e in a GMT400 no problem without the 0411. Updated p/n's and prices and links. Tinbenderm thanks for the props, since this isnt a sticky, in order to find the link, just do a search for "hughes" you'll get 1 single page of results and you'll see it. Updated for part numbers to install manual transmissions. If you need to find this thread use the word "Hughes" as teh search term. This thread comes up as the 2nd serch result. This is all good info, but being the amateur I am, how much harder would it be to do a 6.0L Vortec on a 700r4 transmission? Would there be any major difference in installation? Welcome. The hardest part would be working out the TB cable connection, especially if using a throttle by wire hookup. Beyond that, you'd need a manual transmission program for the engine computer, and find the correct torque converter to fit. You can also get a vacuum operated torque converter lockup module for a 1987 Chevy truck. It's just a vacuum operated electrical on/off switch. Bump: I had forgot the search terms which work for this thread. The search terms "GEN3/4" work for this thread, its the 5th search result. Another thread I use a lot, is the post I made with the GM info about the 3 different Vortec 350 L31 crate engines that are available. The search terms for that thread are "granddaddy". And the "granddaddy of the L31s, the alternative fuel ready GEN 1E SBC L31, used in the W4 trucks from 1996-2003. They are the weirdo looking cab forward commercial trucks where the cab tilts forward for service. See the price of the "granddaddy" of the L31's? More than double. I'd love to say that for paying an extra $2500 that the strong nodular iron crankshaft was replaced with a forged steel crank, or that the Powdered Metal con rods were upgraded to Titanium con rods, or that the cast hypereutectic aluminum pistons were actually upgraded to forged aluminum pistons. What you do truly get is the sodium filled exhaust valves, specially prepared valve seats so that the engine can run gasoline or an alternative fuel such as CNG(Compressed Natural Gas) or LPG(Liquified Petroleum Gas). The "010" is the SBC of the BBC L21 engine which is also ready to rock roll LPG and CNG in addition to gasoline. 19207552 for $5600. Not more than double like the "010" SBC L31 is. Anywhoooo, here is a pic of a W4 truck. I think this a 1995 model, but they all look similar even through 2017. The 2017 has a weird 5.4 liter 4 cylinder engine. Hey guys. First time poster here! I have a quick question about the 19154766 kit from GM... What exactly are the three small spacers for? I get that the bell housing need spacer between the engine because of the larger TC, but not sure what those three little ones are for. I'm glad to see this kit is available. I have a 2-door Tahoe that had its 4L60E take a dump. 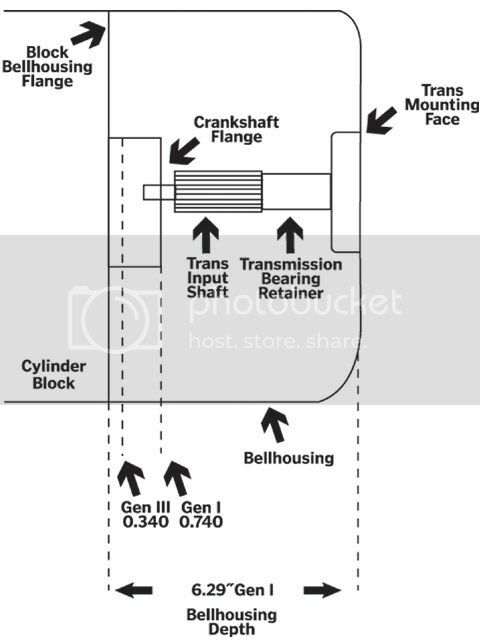 I found a rebuilt trans out of a 2004-2005 truck for $400 with a fresh 300mm TC so I jumped on it and have been trying to research what it's gonna take to get it installed. Looks like this is all I'd need? ?